Puerto Maldonado, Tambopata River, National Park of Tambopata. Day 2. Trip to the Macaw Clay-lick (Collpa). After breakfast you return to the canoe to continue the journey upstream, a further 4 hrs, to an area deep within the Reserve National where the isolated Collpa is situated. 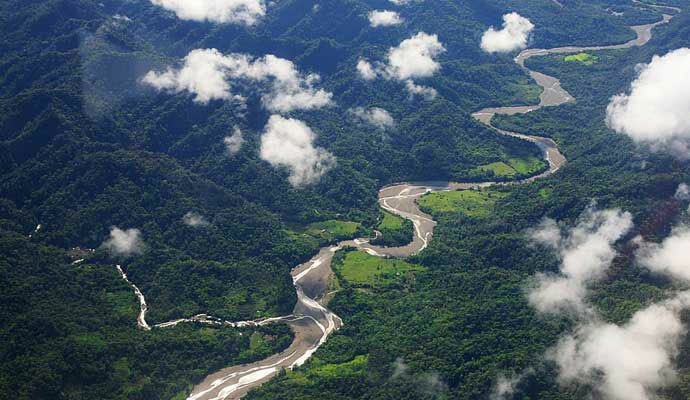 The Collpa is actually one of the large clay cliffs lining the Tambopata River in this area. After lunch you and your guide have the afternoon to explore the trail system in the area. Camping on the beach near the Collpa. (B,L,D). Day 3. Visit the Collpa and return to Tambopata Eco Lodge. A pre-dawn start is needed to get to the clay-lick before the birds. They arrive in search of minerals and salts and the digestive properties of the clay particles themselves. On average several hundred Macaws and smaller parrots visit the clay-lick daily, including Scarlet, Blue and Yellow, Red and Green, and Chestnut-fronted and Blue-headed parrots, among others. This clay-lick is considered one of the largest in the world. Following a late morning hike and lunch we return down river to the lodge. At night you will go searching for Caiman (alligators) and other nocturnal animals by canoe along the Tambopata River.